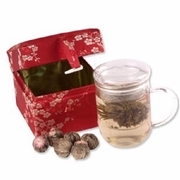 The clear (tempered glass) tea mugs lets you see when your tea is ready. The infuser lets you watch the tea blossom and brew while keeping it separate from the tea water. Including 6 blossom green tea. Tea mug volume is 7.6 oz. Packaged in a beautiful fabric box as shown. Dishwasher safe. Not made for stove-top use. DISCONTINUED BUT WE HAVE 1 AVAILABLE !